When it comes to pulling off the funniest, weirdest, and most elaborate pranks, the French man Remi Gaillard is one of the very best. With millions of admirers from all corners of the globe, he is probably the most well-known prankster today. There's a reason why he has over six million followers on Facebook and another four million subscribers to his YouTube channel. The man's a legend. In his most recent prank, Gaillard took on Star Wars, the most influential space movie franchise of all time. And as expected, the funny French man killed it. The prank is rather tame compared to most of Gaillard's previous pranks but it's especially beautiful because it took on a beloved franchise that entertained millions of people for several decades. In the prank, unsuspecting individuals get to experience what it's like in the Star War universe. A woman gets her office invaded by the dreaded Darth Vader. A man finds himself about to battle stormtroopers. 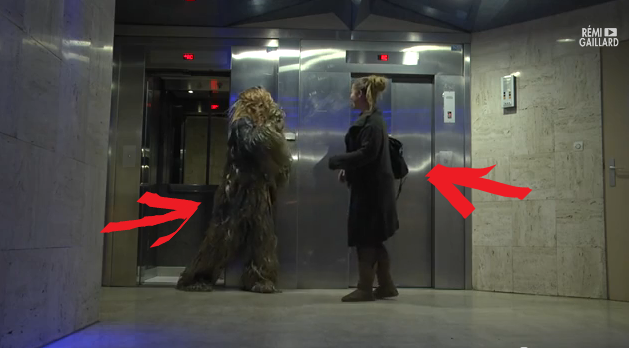 And another woman encounters the hairy Chewbacca in an elevator. Making the pranks even better is the fact that Gaillard and his team exerted real efforts in getting the right looks for the Star Wars characters they featured in the pranks. It's either that or they actually borrowed the costumes from George Lucas.